SARLAHI, June 18: Sarlahi-based Indu Shankar Sugar Mill has started making payments to sugarcane farmers at rates lower than that determined by the government. The mill has been paying Rs 70.64 less than the government's rate per quintal of sugarcane. Earlier, the industry used to pay Rs 531.20 per quintal to the farmers delivering sugarcane at Millgate area and Rs 506.20 to the farmers delivering at different collection centers of the districts. But two days ago, the mill started making deposits at the farmers' accounts at lower rates. “Farmers might be troubled by delayed payment if we wait for the task force's decision. So we started making payment by deducting the VAT amount,” he added. The industry has also started to deduct VAT discounts against previous payments when making new payments to farmers, to 'adjust the excess payment'. After the 'adjustment', the farmers will receive only Rs 400.64 per quintal of sugarcane. A mill official claimed that they have started paying the farmers at the new rate following informal information from government officials that the VAT discount on sugar will be distributed to the farmers as subsidy. 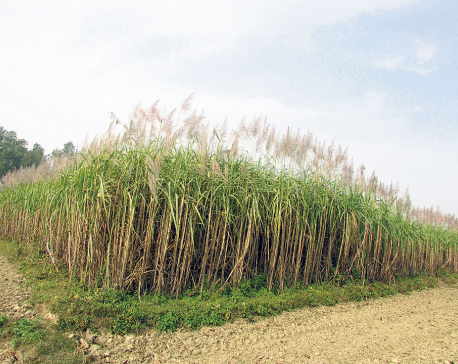 Kapilmuni Mainali, president of Nepal Sugarcane Producers' Federation, said that this act from the mill has sent the farmers in a state of quandary. The industry had halted payments to the farmers since May 30 this year as the government task force was studying the effects of the federal budget announced for the Fiscal Year 2018/19. In the past, the mill used to pay the farmers within a month after the delivery of sugarcane, but this year it has already delayed payments by three months. Demanding timely payments, farmers had started hunger strike from March end. Shesh Mehboob Reja, chairperson of Ward 11 of Hariwan Municipality, had even started fast-onto-death demanding payments to the farmers. On the fourth day of his strike on March 26, the mill and farmers had signed an agreement in the presence of Muhammad Lalbabu Raut, chief minister of Province 2, along with other provincial ministers in Janakpur. The mill had agreed to pay farmers at the rate of Rs 531.20 per quintal of sugarcane. Few days after the agreement, the federal government took a decision to set the price of sugarcane at Rs 536.56 per quintal. But the mill is yet to oblige to the government decision. “Every year, they have been troubling the farmers by creating confusion on price and payment,” Mainali said. Meanwhile, sugarcane farmers in the western part of the district have complained that Dhankaul-based Annapurna Sugar Mill has not made any payment to them this year. Sarlahi is the largest sugarcane producing district of the country. According to government data, sugarcane has been cultivated in over 21,500 hectare of land in the district this year.